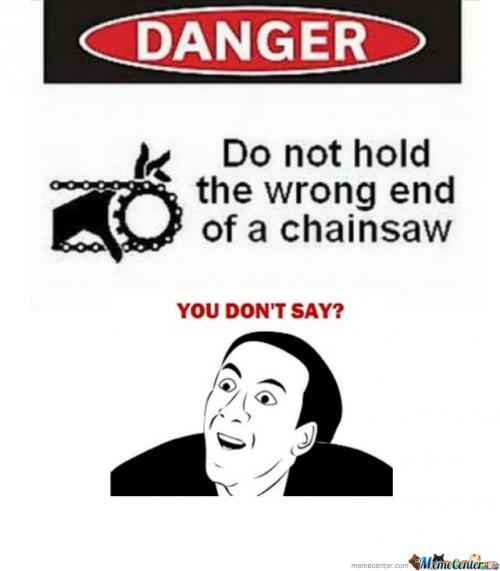 So, for those of you familiar with online memes, surely you will have heard of/come across the now world-famous Nicholas Cage "You Don't Say" meme. However, for those of you who have not, a brief summary: The "You Don't Say" meme is a comic taken from the 1988 film "A Vampire's Kiss", starring none other than Nicholas Cage. The film was presumably terrible, as it involved both Nicholas Cage and the 1980's, however the meme taken therefrom has gained a lot of notoriety, generally used in a situation where someone is stating something incredibly obvious. 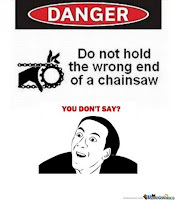 For example, in the photo at right, you can see the very obvious "Do Not hold the wrong end of a chainsaw" on a warning label, accompanied by Nicholas Cage sarcastically saying "You Don't Say?" . Simple enough? OK then, let's move on. Since moving back to Shenzhen, and in my last month of living here in 2012, my roommate Scutt and I have watched a lot of movies. These movies generally fall into one of several themes--British comedies (Four Lions, The Inbetweeners film, etc), documentaries (Inside Job, the Enron Film, and a variety of Ted Talks), or "crappy movies with crappy actors and loose plots centering around Thailand". The last category would include, but not be limited to The Beach, The Hangover II, and perhaps most importantly Bangkok Dangerous, a film so terrible, so badly put-together, and so wholly unbelievable and unrealistic, that it would be correct to say the only reason we ever watch it is because both Scutt and I have an unhealthy obsession with the city of Bangkok, and with laughing at bad acting (particularly the bad acting of the lead actor, Nicholas Cage). So, within our apartment, Nicholas Cage has become something of a cult hero, with the "You Don't Say" face taking a place among the pedestal of quasi-religious iconography in our incredibly sarcastic lives. Taking this a step further, Scutt and I have trademarked a facial expression of rolling one's eyes into the back of one's head and looking slightly horrified whenever someone proposes something worthy of that expression. Given Scutt's excellent (read: better than mine) skills on Windows Paint, he decided to make some slightly changes to the Nicholas Cage "You Don't Say" meme to reflect this facial expression. See at left. So, for example, when the other day we saw some 4-ish year old kid walking around in the street completely naked, while his (presumably) father laid in a hammock being supported by two traffic columns---boom! Nicholas Cage face. So, now that we have covered the Nicholas Cage face and the subsequent changes made by Scutt to reflect our lives seeing an increasing influence from Kurt Vonnegut-esque style humor, let's talk briefly about the picture at left in more detail. Firstly--notice that the app we are using is likely unknown to anyone reading this blog outside of China. 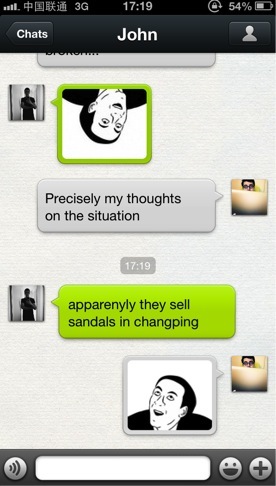 The app is called Wechat (Chinese name is Weixin, 微信). For anyone looking to do any sort of e-business in China ever, Wechat is a hugely important tool for getting word to people about anything and everything. For some further information on Wechat from an unbiased and interesting source, check out Quartz' take on them. And now for my take--firstly, what exactly is Wechat? 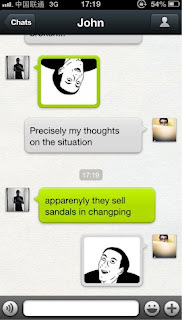 I would liken Wechat to something like Facebook Chat, with a sort of primitive "timeline" feature (see photo at right). And also, it's a lot more "rapisty" for lack of a better word. What the heck do I mean by "rapisty", you ask? Well, basically, on Wechat there is a feature called "look around", which lets you do just that--you look around the area near you for other users on Wechat. Anyone else using that feature at that point and time is visible to you, and you to them. So, for example, I can find out if there is a fellow 24 year old dragon-year born Chinese girl within 200 meters of me right here and now, find out what she looks like (based on posted photos, of course), where she is from, and can send a greeting trying to start a conversation. Creepy? Certainly. Socially acceptable and as common as black hair is in China? Yes, that too. So, there's that feature. The app also includes a "shake" feature, whereby you can shake your phone and it pairs you up with others shaking their phones nearby. Dangerous? In India, absolutely. In China, surprisingly not so much. 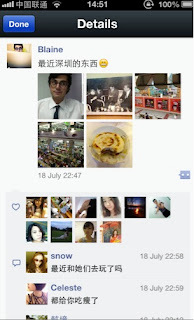 1) I use Wechat to keep in touch with everyone in China. For example, I never end up exchanging phone numbers with a lot of the people I meet here--we just add each other on Wechat. So, once that goes down, my ability to contact most of the people I want to contact in China goes down with it, unless I have (unlikely) acquired some other form of communication with them (such as another Chinese social app like Momo, or maybe something like Whatsapp). 2) I use Wechat to keep up with the places I like to go. Bar I go to is running a special? They message me on Wechat. Starbucks is having a deal on Frapuccinos tomorrow? Starbucks China will most certainly send me a message informing me of this development. 3) It's more important to me now than Facebook. Now, don't get me wrong, I do miss all my friends back home, and I enjoy keeping in touch with them on Facebook. However, Facebook is NOT A FACTOR HERE AT ALL. Obviously the main reason for this is it's being blocked entirely in mainland China. Regardless, though, Facebook is just not a thing here. I never once have looked up someone I've met here on Facebook, and I don't use Facebook to keep in touch with anyone here. So, while going a few days to a week without using Facebook (which is no longer an issue for me) can be inconvenient for keeping in touch with the people 8,000 miles away, going a few days to a week without Wechat can be inconvenient for keeping in touch with the people 8 minutes walk away. Big difference in the relevance and overall utility to my everyday life, here and now. Overall, it was a really good show, and a welcome surprise compared to what I'm used to in Shenzhen (that is, the fact that the "business city with absolutely no soul and less artistic sense than Blaine Curcio" reputation is, by and large, true). 2) I've been taking Shenzhen busses lately. Interestingly, despite being old, decrepit-looking, generally crowded, bad-smelling, and otherwise unpleasant, they are, in fact, faster than the metro in many instances. For example, from my apartment to the office would involve a 10-minute walk to the metro station, 6 minute metro ride, and 5 minute walk to the office. Whereas by bus, it involves a 2 minute walk to the bus station, 6-8 minute bus ride, and 2 minute walk to the office. All for a magnificently cheap $0.35 or so. Apart from that, not an overwhelming number of updates since the last blog post. Meantime, will hopefully continue at least 2-3 days per week moving forward, so more updates to come as they develop.